The Dunlap Towing Company of La Conner, Washington is one of Puget Sound’s homegrown institutions. Founded in 1925 with the purchase of three small tugs, the company initially transported cargoes between the Skagit delta and Seattle. In the years since, the company has grown significantly, including as a player in the foundation of Northland Services. Today, Dunlap’s seagoing tugs can be seen hauling barges to and from Alaska, while their smaller tugs are often involved in hauling barges and log rafts in local waters. 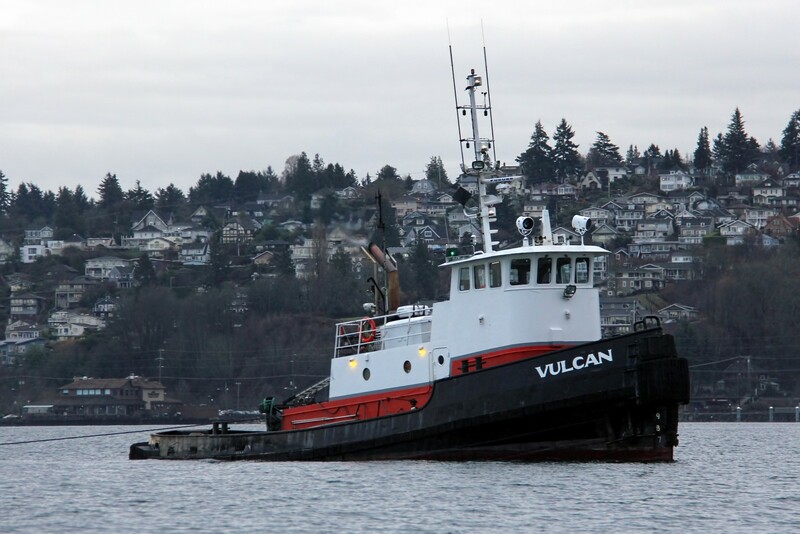 Among those local tugs is the Vulcan. Which can often be found towing log rafts between Puget Sound sawmills and shipping points. While she has bore her current appearance since a rebuild in 1977, her original appearance was actually quite different. Designed by Northwest legend H.C. Hanson as a cannery tender, she was the first all-welded steel vessel of her kind when built at Seattle in 1938. She was initially operated on Bristol Bay, Alaska by the Pacific American Fisheries Co. of Bellingham. After service with the US Army in Alaska during World War II, she eventually was brought into Dunlap’s fleet circa 1965, a company which she still faithfully serves past her 75th birthday. If you like what you see, please take a moment to enter your e-mail address and follow this blog.